The decoy effect, popularly known as the asymmetrical dominance effect with economists, is a phenomenon where people tend to have a change in preference between two options when presented with a third option that is asymmetrically dominated. Though more loved by Economists, the decoy effect also plays a crucial role in making Marketing decisions. Many organizations religiously adhere to this human psychology while planning their product launches in a year. Even the most valuable brands in the world, including Apple, resort to this strategy while positioning their products. Natural human behaviour, resulting from the decoy effect, is often exploited in pricing decisions and also deciding the volumes of the product to be introduced in the market. Companies introduce a third variant of a product which acts as a decoy to increase affinity of consumers towards the product which the company actually wants to sell. Also as a result, companies are also successful to push customers, who usually tend to buy the cheapest product, towards a more expensive product. Let’s try to understand it by a simple example where, say, you would like to buy a new MP3 player. First and foremost, we identify the core proposition in the product. Say in case of MP3 players it may be: the storage capacity and the price – and then play around these two core offerings. In the image below we have a proposition for two players. When put forward with the below choices, some consumers will prefer A for its greater storage capacity, while others will prefer B for its lower price. Now let’s add a new MP3 player to our product proposition. 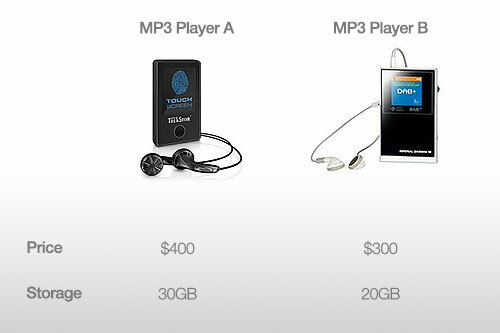 MP3 Player C is more expensive than both A and B and has more storage than B but less than A. The addition of another product i.e. 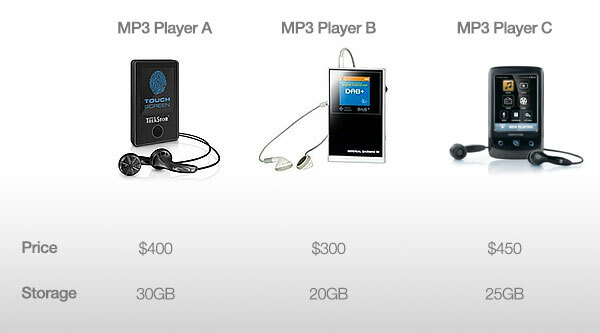 MP3 Player C – which buyers probably avoid (they can pay less for a model with more storage) – causes MP3 Player A, the dominating option, to be chosen more often than when we only had two choices. Because A is better than C in both respects, while B is only partially better than C, more consumers will prefer A now than before. MP3 Player C is the decoy product that will increase sales of A. Now the point is that the company’s focus model is MP3 Player A and not C. The volumes of C in production will be low and will be positioned as a premium or flagship model whereas MP3 player A will be their hero or best-seller model. Amazed to see how companies play with consumer behaviour. This is just one of the many lessons you learn in the area of ‘Economics of Marketing’. Though this concept is very commonly taught in Economics, but its usage in the Marketing context is something which has struck a chord. Thank you for linking my post back. Keep following for more on Marketing and Brand. Amazing this is. Decoy Effect in Marketing – Explained to its best.